Last night at Budget Full Council I spoke about the silent crisis in social care in Tower Hamlets. “A number of savings put forward in 2014/15 are not being progressed at this time due to issues encountered during implementation. These relate in the main to the Adults Health and Wellbeing and Children Schools and Families and amount to £2.89m in 2013/14. Alternative savings have been put forward”. No information has been given about these “alternative savings”. Taking close to three million pounds out of social care budgets can’t be done easily, especially when cuts are being made because planned savings are off track. Then in this year’s budget the Independent Mayor proposed to save a further £3.5 million through “vacancy management” – expecting the directorate covering social care to make do with a 5% cut to their staffing budget. I went to speak to the staff side trade unions about the impact these cuts would have. They told me that social workers are already under pressure, with admin support cut in previous budget rounds and restructuring and voluntary redundancy meaning that social workers are already on their knees, with huge case loads. Workers with previously unblemished records are being taken through capability procedures because their caseload is too much to cope with. They spoke about the bitterness that social workers feel when they sit in increasingly cramped offices, on the phone fighting for desperately needed resources for the vulnerable families they care for, and look out the window and see the Mayoral Mercedes gliding out of Mulberry Place (other council leaders happily use public transport) and watch the Mayor’s office rapidly expanding in size and cost, stuffed with over paid advisors. Some of the Mayor’s spending proposals sound great. Some of the best are the cheapest – a grant to the Unite organising centre at St George’s Town hall is less than one advisors salary, but could be transformative, as the partnership seeks to tackle our adult skills gap. Last night’s budget spending spree is paid for off the backs of the most vulnerable. The “efficiency savings” that the Mayor cites in his press releases are cuts to social care staffing budgets. There is a failed leadership in the Town Hall when the Independent Mayor and his cabinet are sailing around in the borough in tax payer funded taxis and chauffeur driven Mercedes, and social workers are under pressure to take voluntary redundancy. The people making those decisions are doing all they can to hide that truth. Overpaid advisors release nonsense press releases, scrutiny committees ask for information they are never given, and all the rhetoric and bombast from the Town Hall is intended to distract from a real public debate about the future of our borough. Times are tough for many in Tower Hamlets, and will get harder for many in April when the Tory government benefit cuts hit. We have the highest child poverty in the UK. At the same time we have the highest economic growth potential in London, and Tower Hamlets is full of people and organisations with so much to contribute to bringing hope and jobs to the borough. What local people need is honesty about the scale of the challenges and opportunities we face, a public conversation about solutions and open transparent decision making to renew trust in our politics and create a shared future for the people of Tower Hamlets. Thank you to former Bethnal Green and Bow MP Oona King for backing me for Mayor. You can read more here. Watch this space for more supporters to be announced soon. 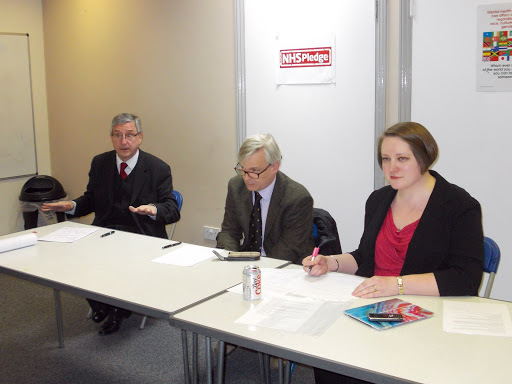 On the 13th February I, alongside Dr Sam Everington, the chair of the Tower Hamlets clinical commissioning group and Jim Fitzpatrick MP, with Labour members and local people, launched the Tower Hamlets NHS Pledge. This was an important moment. Andy Burnham and I launched our consultation on the NHS Pledge in November, and I’ve been talking to members and residents about what matters to them since. This Pledge is the outcome. The NHS Pledge demonstrates our commitment to shared values at a difficult time for the NHS. Activists, councillors and our MPs stood together with GPs and health professionals in opposition to the Tory top down NHS reorganisation. Now, we stand together again, united around a core set of values. At a time of change for the NHS, with £50 million of cuts to make locally, we will continue to campaign together to protect our health services from this Conservative led government and to improve the physical, social and mental health of the people of Tower Hamlets. We are committed to working together to improve the physical, social and mental health of the people of Tower Hamlets. We intend to narrow the health inequalities between Tower Hamlets and the UK, and between the communities and areas of Tower Hamlets. The NHS was born under a Labour government rooted in the east end of London. We will protect an NHS that is free at the point of use, resisting charging and restrictions. Primary and acute care providers, commissioners and the local authority must combine resources to achieve person centred health and social care. We will not allow artificial targets or market pressures to undermine patient care. Mental health must be brought to the heart of the NHS, with parity of esteem with other services. Innovation in public health will be driven through broad collaboration between the NHS, local authority, voluntary sector and local people. Waiting times across the UK have already increased by 25% since the General Election. We are committed to maintaining Labour’s waiting standards for cancer care, operations and A&E and will seek to develop standards for talking therapies. The availability of services in Tower Hamlets must be on the basis of need. Decision making must be transparent. We will stand against any introduction of financial incentives that could lead to sub optimal care in the NHS. We believe in putting people before profits, valuing our workforce. In November 2012 Andy Burnham came to Tower Hamlets to launch a conversation with local people about a Tower Hamlets NHS Pledge. I’ve been leading that consultation, and have had many conversations with activists and residents about their priorities for our NHS. I will be launching the Tower Hamlets NHS Pledge on Wednesday at 7.30pm, with Dr Sam Everington GP, the chair of the Tower Hamlets clinical commissioning group. GPs in Tower Hamlets stood with us in opposition to the damaging Conservative top down reorganisation of the NHS. Now we stand together again to protect local health services and to improve the physical, social and mental health of the people of Tower Hamlets.